Ironstone Vineyards, the producer of Leaping Horse, is known for owning and operating several leading US wine brands. In addition to vineyards in the Sierra Foothills, Ironstone draws on the production from its Lodi appellation vineyards—some 4,500 acres (18 km2) in all. 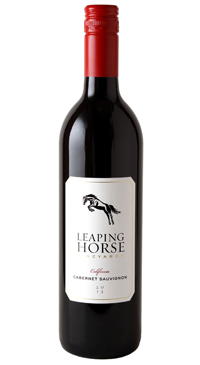 Leaping Horse Cabernet Sauvignon is a luscious Cabernet with deep red-purple hues and flavors of black currant and cherry with hints of blueberry, eucalyptus and mint with a touch of oak. It’s smooth, rich and deliciously drinkable.